Water Water Everywhere, but is it Potable? We all know water is the staff of life, but in a world where over 90 percent of it is unsafe to drink, how can we remain healthily hydrated on the trail? From Tusker’s perspective it’s relatively simple – boil it and when necessary use Chlorine Dioxide. Continually test it to make sure it’s potable and never take chances. Tusker travels to some of the world’s best and worst water countries in the world. Iceland’s fast and cold flowing mountain streams carry some of the world’s most potable water. Many hikers drink straight out of the rivers and never have a problem. The Icelandic government tests the water there regularly and it is uncontaminated. Conversely, Nepal’s water is among the world’s worst. Poor sewage systems and shallow ground water leads to rivers contaminated by human, industrial and agricultural effluents. High child mortality rates result from water born disease. Tusker’s team boils and chemically treats all water there before sending its trekkers out with their water bottles full of clean water. Kilimanjaro and Mongolia both have good glacially produced water, “but we treat it,” according to Tusker founder Eddie Frank. That treatment includes boiling it which is the sure fire way to eliminate Giardia, the most common backcountry water issue. Giardia results from wild and domestic animal feces that contaminate rivers and streams. Tusker’s crews also use Chlorine Dioxide, a chemical compound and disinfectant that can neutralize waterborne bacteria and viruses. Backpackers often carry CD tablets in their packs to use on water taken from streams. In Tusker’s early days Eddie didn’t take water issues overly seriously, but that has changed as he’s seen increasing contamination on his travels. He experienced Nepal’s bad water firsthand in 1999 when 26 out of 30 people became ill on an exploratory trek Eddie and his wife Amy were guiding. They treated everyone successfully. When they designed Tusker’s trip to Everest Base Camp, they instituted careful handling of water and food by hiring their own cooking crew all the way to base camp. Water filter technology has changed dramatically the last decade. The newer systems are lighter and more effective. Tusker had used a Katadyn pumping filtration system in the early years, but it had many parts that could break down and was too heavy. 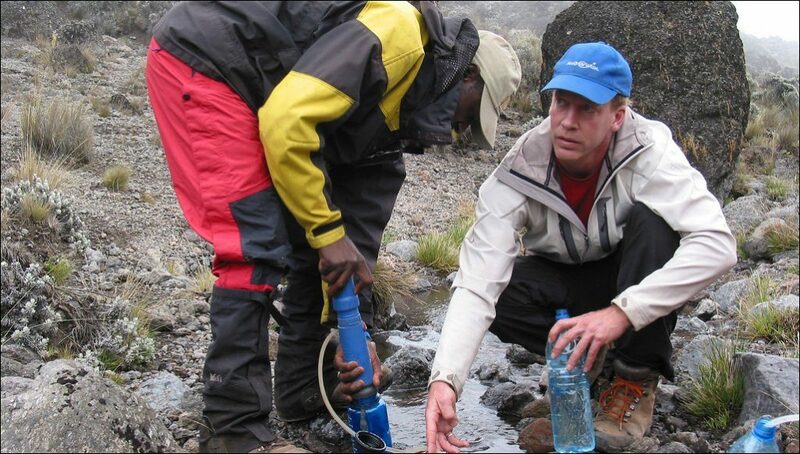 For trekkers who wish to bring their own filters on a Tusker trip, Eddie recommends Aquamira’s Frontier system, a lightweight and cost effective way to filter water on the trail while on the move. On all Tusker trips, water is provided at camp for trekkers to fill up for the day, but should hikers want to drink from streams along the trail, the Aquamira is effective in treating Giardia and just about everything else. For more compromised water sources, it’s best to only drink water that has been treated by the Tusker crew. All of us would love to drink straight out of a sweet flowing stream. Unfortunately in today’s world, that dream must be abandoned for the sake of staying on the trail and out of the hospital.